The premises are situated in Byford Court which is approached from Crockatt Road which is the most modern extension of the Lady Lane Industrial Estate. Nearby occupiers include Celotex and Buildbase along with a wide variety of local businesses. The unit is situated about quarter of a mile from the A1071 Hadleigh Bypass, half a mile from the new Morrison's Superstore and about three quarters of a mile from Hadleigh town centre. Hadleigh itself is an attractive and expanding Market town with a population of around 12,000 and which serves a wider catchment area. The town has seen continuing growth with a major new development on the eastern side, being undertaken by Persimmon and where further industrial development is also proposed. The town is situated some 9 miles west of Ipswich, 12 miles from Sudbury and about 13 miles northwest of Colchester. There are main line train services from both Ipswich and Colchester with travel times to Liverpool St from the latter being less than 1 hour. The property comprises an end of terrace industrial unit, built about 10 years ago and constructed of cavity brick/block work with part colour coated profiled steel cladding under an insulated profiled steel clad roof. 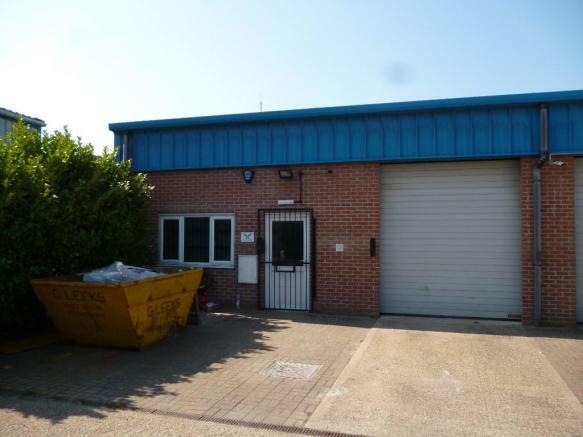 The unit provides a single office, WC and workshop/warehouse area, all of which has been recently redecorated with principal access by means of an insulated up and over door, 9'10" high by 9' 6" wide. Windows and doors are UPVC double glazed units and there is electric heating to the office and cloakroom. Adjacent to which is a single WC with washbasin. As the rateable value is less than £12,000, the building would qualify for maximum Small Business Rate Relief. TERMS	The property is available to let on a new lease on full repairing and insuring terms for a term to be agreed. RENT	£8,000 per annum exclusive. VAT will be chargeable on the rent and a small annual charge is levied in respect of maintenance of the forecourt and common areas. Property reference 5-Byford-Court-Hadleigh. The information displayed about this property comprises a property advertisement. Rightmove.co.uk makes no warranty as to the accuracy or completeness of the advertisement or any linked or associated information, and Rightmove has no control over the content. This property advertisement does not constitute property particulars. The information is provided and maintained by Birchall Steel Consultant Surveyors, Suffolk.